This is an easy pickling process and the taste is so good its polished clean as easily too. I especially like its color. It's eye candy and I leave it on the kitchen counter or occasionally on the dinning table and enjoy looking at it everytime I pass by. The recipe is passed on by my husband's grandmother. She is a whiz in the kitchen. It's amazing how she has all the recipes ingrained in her brain and does not consult notes (recipes) while cooking. You say the word and she will just blurting out the entire recipe. Very fascinating lady indeed! Fantastic at violin, cooking and sewing I would call her an all rounder. She is quite old now and unfortunately not too well. However, I am sure she would be glad to know I am sharing her recipe with you all. Enjoy it! This double shade of the onions in the picture below is as its getting marinated but after bottling in 4-5 days all of it gets evenly colored. 2. Peel the shallots and wipe clean with a damp cloth and dry cloth respectively until cleaned dry. This will make sure the onions will stay longer pickled and not get spoilt. 4. Once the water cools down add equal part of vinegar and pour over the chilis and onions filled in a bottle. Serving: Its a fun pickle. You can serve it as it is or cut and add them to your salad. Decoration: Let your imagination take flight. Keep them in glass bottles of different shapes and size and they look wonderful enough that your guests will go Wow! lovely dear........simple and tasy pickle......way to go..
Not only does this sounds delicious, it doubles as a great kitchen decoration. For those looking to give a great housewarming gift or a present of thanks to a dinner invite; this would be a great choice. Oh gosh! Look at the colour~~so beautiful! looks colorful..these will be good on salads and subs..
Love pickles in vinegar.Just send me that cute bottle.Love to your grandmother! Wow! !Grandmom's always amazes us by giving such great recipes,isn't? Pickels looks so pretty and lovely presentation as well! Thanks for sharing. Pickle seems so cute . Nice recipe. Lovely colorful pickle and easy too. Pickle...adipoli..Colourful.Congrats on ur awards and thanks alot for sharing with me dear..
Great shot. What goes well with those pickles? I'm curious. And thanks for stopping by my place and for your kind comments. Thank you guys! Appreciate your well meaning comments. looks so yum! lovely click! looking forward to checking out your blog :) I love pickled onions hehe much to my hubby's horror hehehe . This is definite eye candy! Very nice. Wow! This pickle is gorgeous! It must taste really palatable! Congrats on the animated award and thanks! this one looks too good! and as someone mentioned perfect to be gifted as well! who can say no to pickles. will make this for my dad when i go to kerala. he will love it! looks great!! 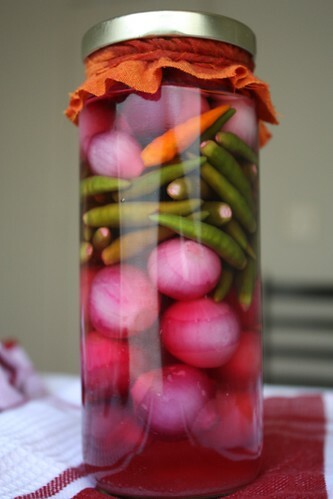 Nice idea to pickle onions and green chilies. 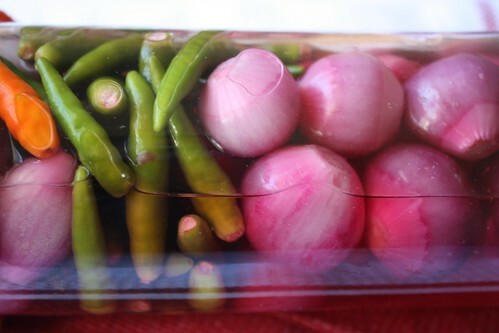 I frequent the Dhaba express in Chennai just for these pickled onions and chillies.. Wow, thanks to ur hubby's sweet granny, I now know how to recreate the magic!! Thanks dear for sharing it with us! Looks too good....I agree with Namitha, it would be a lovely showpiece in any kitchen..thanks for sharing. Sounds amazing and looks awesome..
Would be excellent with kanji right?? Yum delicious pickle to go with anything. Very nice..going to make it for my wife secretly and present her with a surprise. :-). congratulation to the collaboration for the great award. congrats on ur award and thanks a lot for sharing with me.